Leamington slipped to a 2-1 defeat against a lively Birmingham City Development squad on Wednesday night, writes Paul Okey. Missing Jamie Hood, Jake Jones, Lee Moore and Rob Ogleby - all likely starters when the season kicks off on August 8 - Brakes understandably struggled for fluency. There were plenty of positives to take from the runout on an individual level, though, with trialist Michael Williams doing his chances of earning a deal no harm with a commanding performance at right-back. Connor Gudger was equally committed on the opposite flank, showing a pleasing willingness to bomb forward, while Jack Edwards was rewarded for an industrious performance with Brakes’ equaliser in the 68th minute. Had Ben Mackey showed the midfielder’s composure in front of goal the home side would have been out of sight. However, the muscular frontman’s radar was off despite him giving the young Blues defence a torrid time. Mackey had already had an early sight of goal before the visitors opened the scoring in the third minute, Viv Solomon-Otabor showing a turn of pace to slot past Tony Breeden. 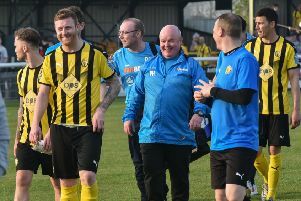 Brakes were rescued by the assistant referee’s flag in the 39th minute after Denny Johnstone pounced on a Breeden parry, the official deeming the striker to have been in an offside position from Charlie Cooper’s initial piledriver. The home side were much improved after the break and Richard Taundry, another player to catch the eye, won the ball in midfield and rattled the crossbar with keeper Connal Trueman beaten. Edwards showed good control to bring down a searching crossfield ball, but his shot lacked conviction while Truman had to be at his best to tip away a fierce Mackey effort. Solomon-Otabor looked set to add a second with a far-post header but Breeden showed raced across his line to deny him with a sprawling save. Moments later, Edwards levelled, evading a challenge in the box before driving a left-foot shot ball across Trueman and into far corner of the net. Alfie Crooks should have restored Blues’ lead after some fine trickery from substitute Wes McDonald on the left but he fired his first-time effort over the bar. But McDonald made no mistake seconds later when he was allowed time and space to pick his spot from the edge of the box, with Breeden unsighted. A galloping run from Williams almost brought a second equaliser for Brakes in the dying seconds, but his shot was deflected for a corner from which Jamie Tank headed wastefully wide. Brakes: Tony Breeden, Michael Williams, Connor Gudger, Joe Magunda , Jamie Tank, James Mace, Jack Edwards, Ross Oulton (Danny Williams, 57), Ben Mackey, Ben George (Ellison Porter, 70), Richard Taundry. Subs not used: Matt Warner, James Husband, Martyn Naylor, Lewis Fenney, Matt Hill.